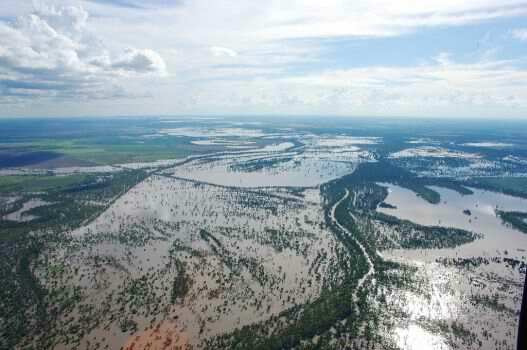 MELBOURNE (Australia) – Thousands of people have been evacuated from the parts of the eastern Australian state of Queensland, where river heights are threatening to reach record levels, local media report. Over 2,000 people were forcibly evacuated from the inland township of St George on Saturday night, in what the Australian Broadcasting Corporation says was the largest evacuation in the state’s history. The Australian newspaper says the nearby Balonne River has already passed the all-time high of 13.4 metres (44 feet) recorded during the devastating floods of 2010, and it is expected to continue rising to over 14 metres (46 feet). The newspaper says that some 300 to 400 residents had stayed to protect their properties, ignoring warnings that rescue services might not be able to reach them later. Some had built a temporary levee in an attempt to hold back some of the water, but the state Premier Anna Bligh said their efforts had “no prospect” of succeeding. Twenty houses were destroyed over the weekend and a final evacuation was scheduled for Monday morning, local time. “This is the third flood this town has coped with in just less than two years, so there’s a lot of distress and a lot of emotion,” Bligh added, confirming that she would visit the flood-affected areas on Monday. Snow made a rare appearance in Algiers, the capital city of Algeria. Cold air associated with a storm system diving into northern Africa provided for some decent accumulations of snow in the north African country. According to Accuweather Meteorologist Eric Wanenchak, most reports say the last time Algiers saw this kind of accumulation was at least seven years ago in 2005. He said Algiers must fight a combination of limiting factors in order to see snowfall. First, the city is near the Mediterranean Sea, which is still quite warm, currently in the low 50s. Youtube user mohsal57 shows snow falling on the tropical trees in Algiers, Algeria.